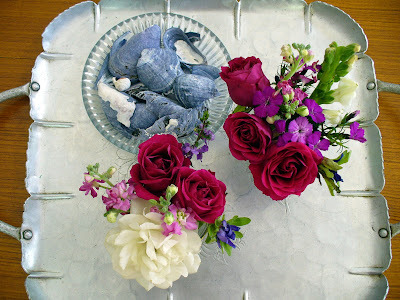 A large flower arrangement began to wilt so here are two little "salvaged" bouquets. Also shown is one of my favorite aluminum trays - I have a growing collection. If you're curious about their interesting place in American history check it out here. Made primarily in the 30's - 50's, many didn't make it through the WWII era when metal was scarce. The photo below has me wondering how to put the pattern from the compote onto a wall...hmm? 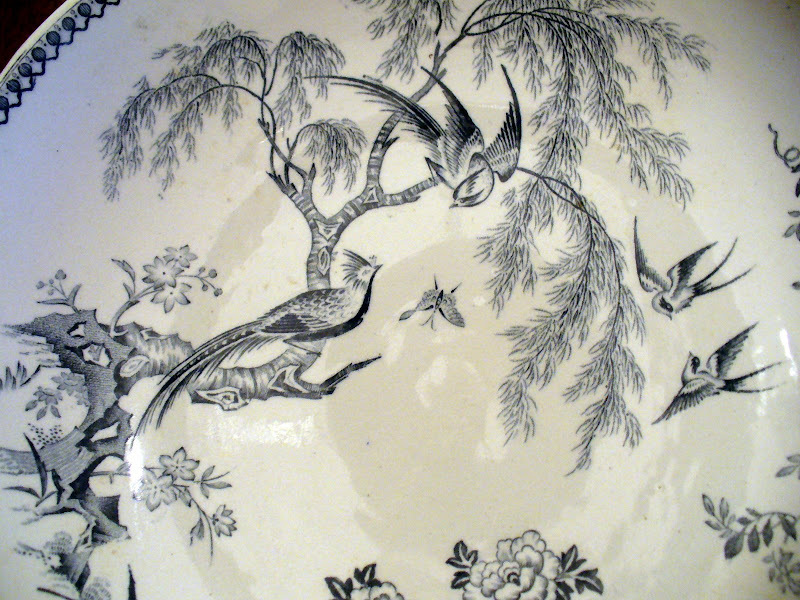 Image of the Willow Pattern via The Stencil Library, found via Is It Nap Time Yet? and now I can't find the link to that great blog! Just saw this picture on Katie Did and had to add it to this post. Love this painted mural! Southern Accents, July - August 2008, designer Phoebe Howard, photography by Roger Davies. I love old transferware. I have a bunch of random bits of it... great stuff! I love your trays. Just beautiful and that bathtub takes my breath away. 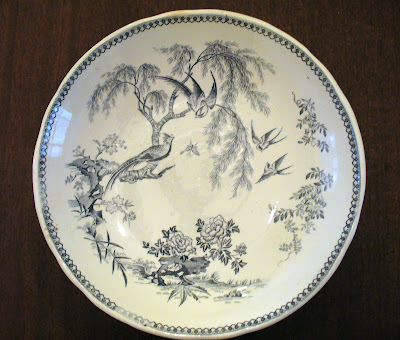 I love transferware and have a large collection, on walls and in cabinets. I mostly collect the pink, but I do have a small collection of brown aesthetic that I adore. What is the little bird in your top photograph. It's lovely. I did see the new post at Katiedid. Wonderful bathrooms, aren't they? 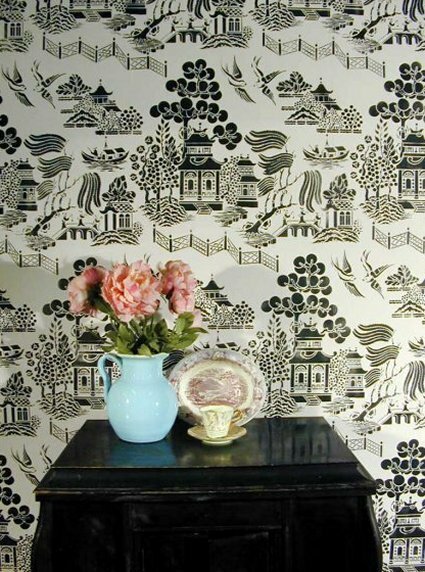 I love your transferware and the wallpaper! Can I get the source through the site you mention? I will take a look. It mught just be the perfect thing for my powder room! And thank you for the nice mention! Eek! I may have written about the mural in a confusing way. It is actually a painted mural, not a mosaic. Isn't it strange how something you've been working on/thought of visualises itself! I have been working on a Willow pattern design inspired by an embroidery which my Grandmother did years ago. 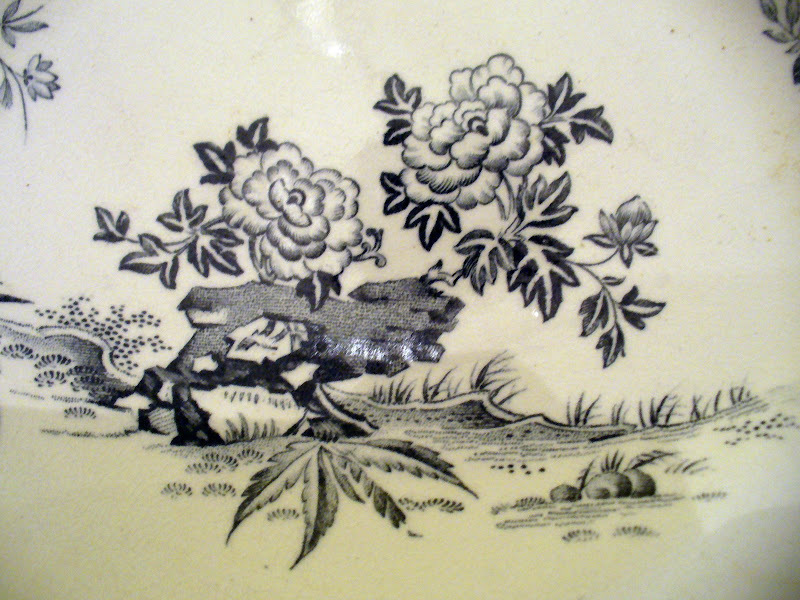 Perhaps we'll be seeing more of this classic motif on other home wares? 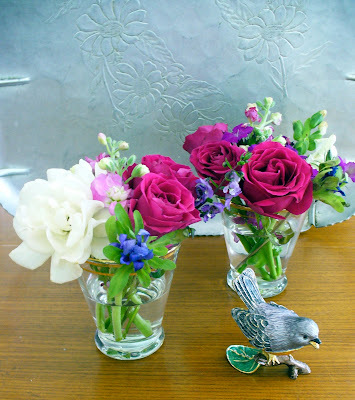 I love the pics, and the flowers are lovely. That bathroom is just amazing! I want it!! Nice segue-way from the block prints to this tray - my mother has several of these sorts of trays and now I love them even more that you made it look chic. 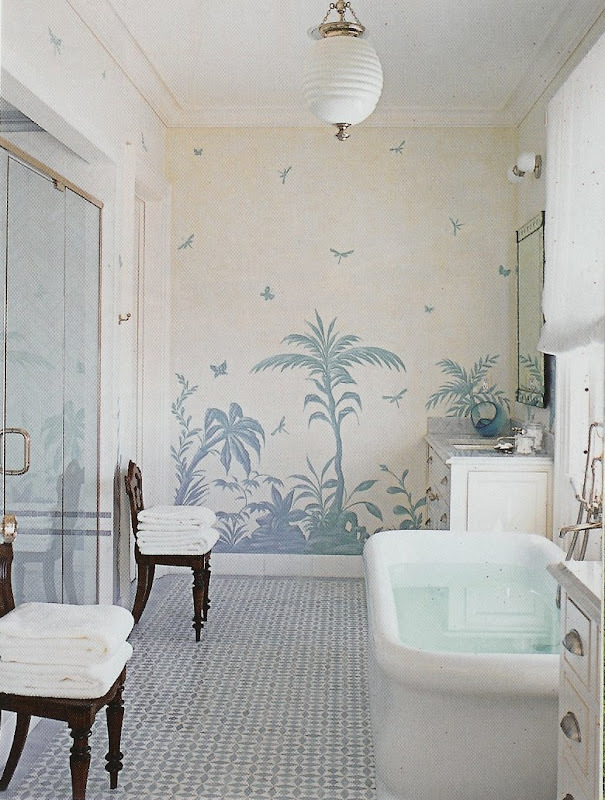 That tiled mural is dreamy and that tub looks so inviting. Calgon, take me away! Katie Did - Thanks - Ive changed the post to read painted mural, I read your post wrong. Thanks everyone for all these nice comments. Seems like many people are fans of transferware. 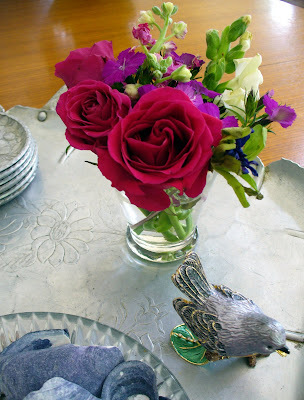 The photos of your aluminum trays are lovely. LOVE love love these flowers.. 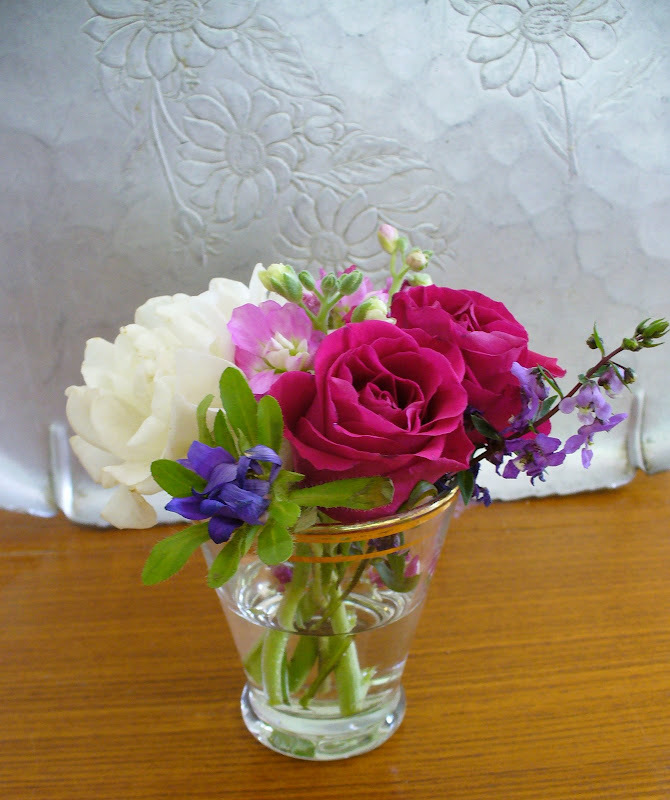 I featured your flowers as a part of our centerpiece of the month for September.